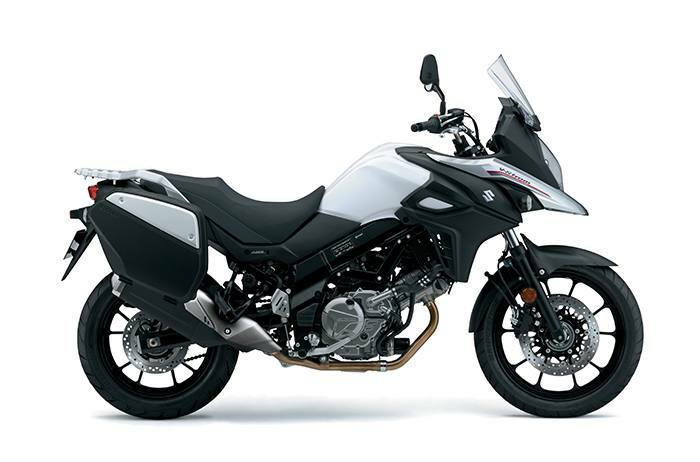 Renowned for its versatility, reliability and value, the V-Strom 650 has attracted many riders who use it for touring, commuting, or a fun ride when the spirit moves them. It is a touchstone motorcycle balanced with a natural riding position, comfortable seat and a flexible engine character that produces stress-free riding during brief daily use or a high-mile adventure. The new 2017 V-Strom 650 now mimics the looks of the V-Strom 1000, unifying the V-Strom family. This new V-Strom has increased engine performance and great fuel economy while achieving world-wide emission standards. A number of other updates, including weight savings and a thinner chassis, has resulted in a V-Strom that is more versatile, more controllable, and more accessible to elevate its total performance so it’s simply “More V-Strom”. And that’s what a rider wants; more of a good ride. New, lighter ten-spoke cast wheels are shod with Adventure-spec Bridgestone BATTLAX 19-inch front and 17-inch rear tubeless radial tires for good all-around performance. *The Traction Control System is not a substitute for the rider’s throttle control. It cannot prevent loss of traction due to excessive speed when the rider enters a turn and/or applies the brakes. Neither can it prevent the front wheel from losing grip. *The ABS is a supplemental device for brake operation, not a device for shortening stopping distance. Always remember to reduce speed sufficiently before approaching curves.